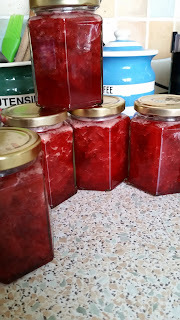 In all my jam adventures to date (I have definatley reached a stage in life where I can consider preserving a gateway to adventure) I'd never made a strawberry jam. Mostly this is because I don't really like it that much - to sweet - so there are always better things to do with strawberries (which I love, but just as they are. The better thing to do with them is eat them). However, I was short of jam (unthinkable) and M&S had some heavily reduced English strawberries so it was the obvious choice. It was also a procrastinating tactic to avoid a job which I needed to get done (400 words on a guide to whale watching - the guide* is excellent, but beyond saying that it's excellent, clearly laid out and full of useful tips which doesn't take 400 words what can you say?) but was finding tough going. 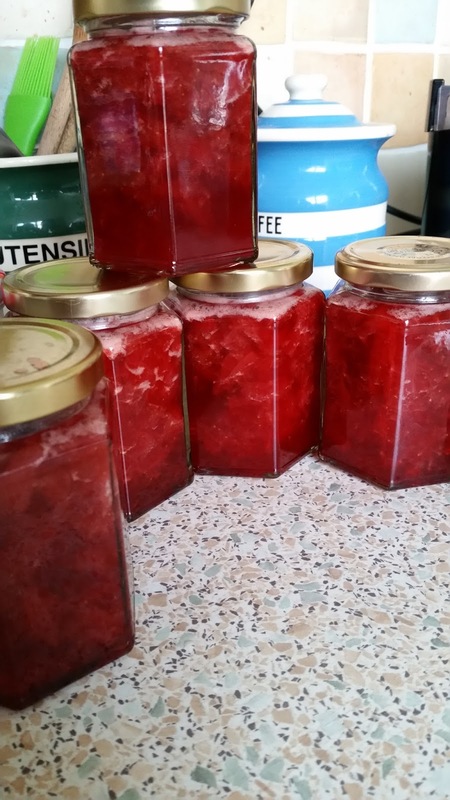 The recipe I used was a variation of the raspberry fridge jam from the river cottage handbook on preserving. That really is an excellent jam (raspberry would be my favourite jam), tart enough to balance the sweetness of a scone, or the fat content in cream or croissants- perfect. It's also very, very simple. Half the weight of the fruit in preserving sugar (the sort with added pectin. Half the fruit mashed up, then the rest along with the sugar added to the pan. Slowly bought to a rolling boil to let the sugar melt, then boiled for 5 - 7 minutes, let to cool for 5 minutes, and then into sterilised jars. The low sugar content means you get a very loose set (it's a runny jam) and need to keep it in the fridge, but it also means less sugar and more fruit flavour. Cooking the strawberries and sugar, even with the addition of some lemon juice in the hope it would add a bit more tartness, smelt exactly like boiled sweets which made me worry it would still be sweeter than like. It is. But even so it's turned out to be good with yoghurt will doubtless find its way into other things as well. * It's Mark Carwardine's Guide to Whale Watching in Britain and Europe, it's well worth having a copy of if you want to see whales, full of very useful tips about where to find them, and how to identify what you might be lucky enough to see. I've mostly been reading, reviewing, and writing for other people and places this week, along with preparing for a frantic couple of weeks at work before I head off on holiday (two weeks today as I write this I'll be in a plane bound for Shetland, and I absolutely cannot wait). I came to it expecting it to be interesting in a worthy kind of way, and enticed by the prospect of being able to 'read the sea like a Viking' by the time I was finished with it. Happily for me it turned out to be interesting on every level - though it may have been something of a trial for D that I started so many conversations with 'did you know...' whilst I was reading it. He mostly did know, he has his yacht masters, and a far more scientific bend of mind than I do. 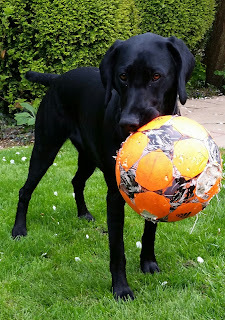 He bore with it all very patiently but I suspect he would have preferred that I'd saved it for holidays as well when, a) he could have read it too, and b) dad, who is partially imobalised after a knee operation would have had to out up with more of my observations. The starting point for this book is when the author, having newly passed his yacht masters exam is seeking a deeper, more intuitive understanding, of the sea. To his initial surprise (and mine too) it turns out you can learn more about how water behaves on dry land than you might on a yacht (where the business of sailing takes precedence). The way water in a pond, a puddle, or even a cup of tea behaves can tell us a surprising amount about how the water in an ocean behaves too. For all the time I've spent looking at the sea, it seems I've understood precious little of what I've observed, or even observed as much as I might. Finding somewhere where the science behind everyday phenomena is not just clearly explained, but also explained in an engagingly page turning way is a game changer. Being able to decipher the patterns in what your seeing has to make any scene more interesting - and when it comes to water deeper or faster moving than a puddle there are practical safety related implications as well. 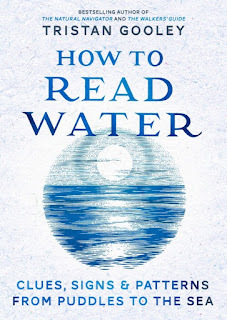 Not that learning how to read water strips it of any of its mystery or romance, rather it opens up a world of interconnected events, which if anything make oceans seem far more complex than the untutored gaze might imagine. 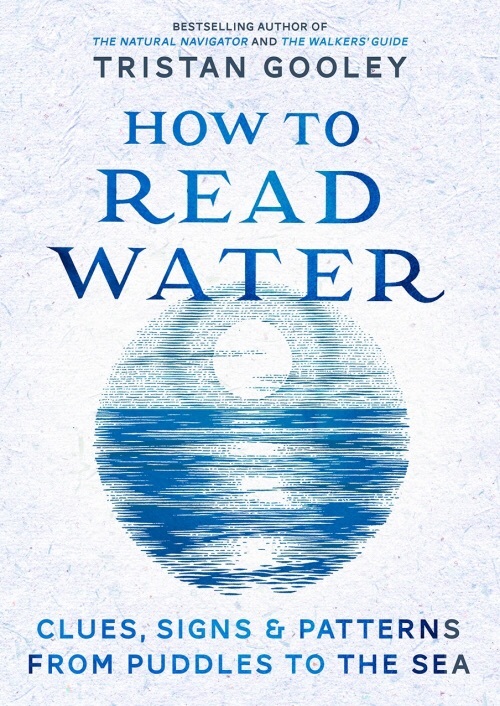 This isn't an exhaustive survey of water and how it works - it couldn't be in 330 pages, but it's more than enough to give a thorough grounding in more than the basics. The explanation of tides is an excellent example of this, it takes more than a dozen pages, and is easily as much as I'll ever need to know, but again the more than basic explanation means I feel I have a much better grasp of the actual basics. It's a brilliant book, full of information, anecdotes, and things you want to see or try. I've always thought a sailing holiday would be much like a caravan holiday but wetter, less comfortable, more dangerous, and far more expensive - but this is the kind of book that could change my mind about the possible charms of going to sea. More importantly though, it is a book that I can get lost in, learn things from, and thoroughly enjoy. It was great for dipping in and out of, but a lazy day when I have nothing else I need to do but explore the places it takes me would be even better. on Thursday R and I had another Stratford trip. This time to see 'The Alchemist', the omens were good when a hitherto resolutely grey sky suddenly turned to blue as we found the car park. The sun stayed out so we managed to enjoy fish and chips on the grass by the river (on the upside we weren't mugged by geese, on the downside we were subjected to the efforts of a particularly bad busker) surrounded by other people doing the same and all studying programmes. The remaining chips disposed of in pigeons we got our own programmes and finally did our homework as to what the play might be about, and then took our seats. It seemed a hood sign that the director didn't make an appearance (opening nights can be hit or miss) but this play (unlike Cymboline) was ready to go. We were back in The Swan, and though my experience is relatively limited, it's easily my favourite theatre. There's something about the feel of the place that I just love, that I've seen so many very good things there adds to its charm too. This time was no exception. The set was beautiful; dark, candlelight, and convincingly like a contemporary Dutch still life - I wish I could have taken pictures of it. And then there was the opening music which successfully set a tone of sly humour and hot the first round of applause of the evening. 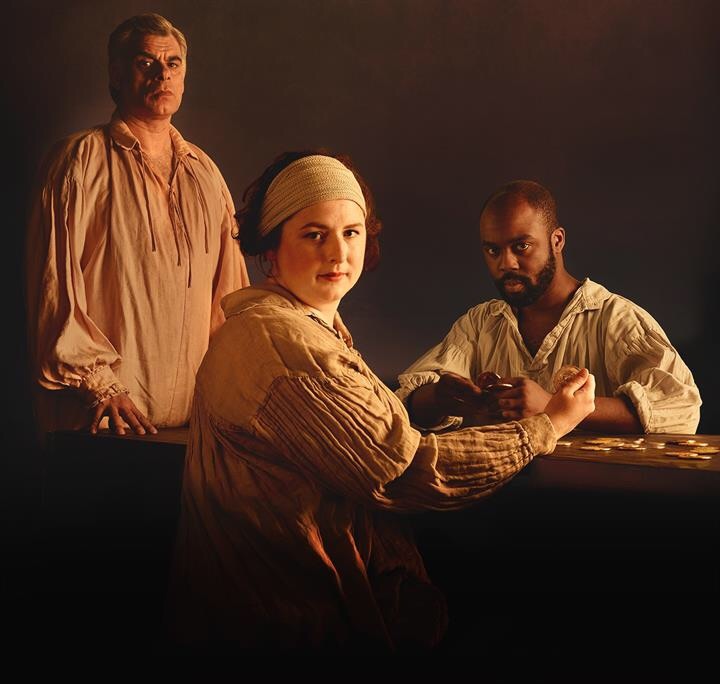 I know the play is 400 years old but I don't want to give away the end because the conclusion surprised us. What I will say was that the moral ambiguity was refreshing! Meanwhile there were some bloody marvellous performances. Siobhan McSweeney was just brilliant as Dol. As was Ian Redford as Sir Epicure Mammon, he has some extraordinary speeches to deliver, and was so good he too got a spontaneous round of applause. We really liked Mark Lockyer's Subtle as well - but everyone was good. So good that I wish I could see this one again, and for anyone going to Stratford this summer - don't miss it! I should probably have re read this one before 'Northbridge Rectory' but as it was a re read I didn't, and in the end it doesn't really matter. The reason I might have done them the other way round is because this one published in 1939 is very much pre war, whilst the 1941 'Northbridge Rectory' obviously is not. 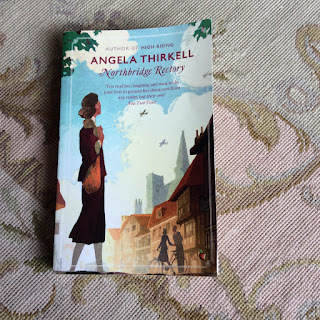 I've been reading a little bit about Angela Thirkell, mostly via blog posts I've found but still don't really know very much about her beyond how very well connected she was. I can well imagine that a lower middle class life in Australia with her second husband wasn't destined to be very successful - in fact it seems neither of her marriages were particularly happy, and neither was the relationship she had with at least one of her sons. The snippets of information (or perhaps it would be more accurate to say gossip) that I've picked up make me wonder how much of herself Thirkell put into her novels. I suspect the answer is quite a lot, but I haven't done enough research to really know. I'm also coming to the conclusion that she spends a lot of time writing the world as she feels it ought to be. In 'Before Lunch' there's no hint of war in the horizon, if I hadn't checked the date it was written (I get a little bit obsessed with dates) I would have thought it was a good decade earlier - or more, the feel is almost Edwardian. I assume these books were shamelessly nostalgic even when they were hot off the press. 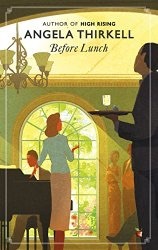 'Before Lunch' has a series of romances at its heart, there's young love destined to end in a happy engagement despite various obstacles and misunderstandings (in the best tradition) along the way. There's a more sedate affair between a middle aged couple, which also has some obstacles in the way, but is also destined to end happily. And then there's Mrs Middleton, another woman on the threshold of middle age. 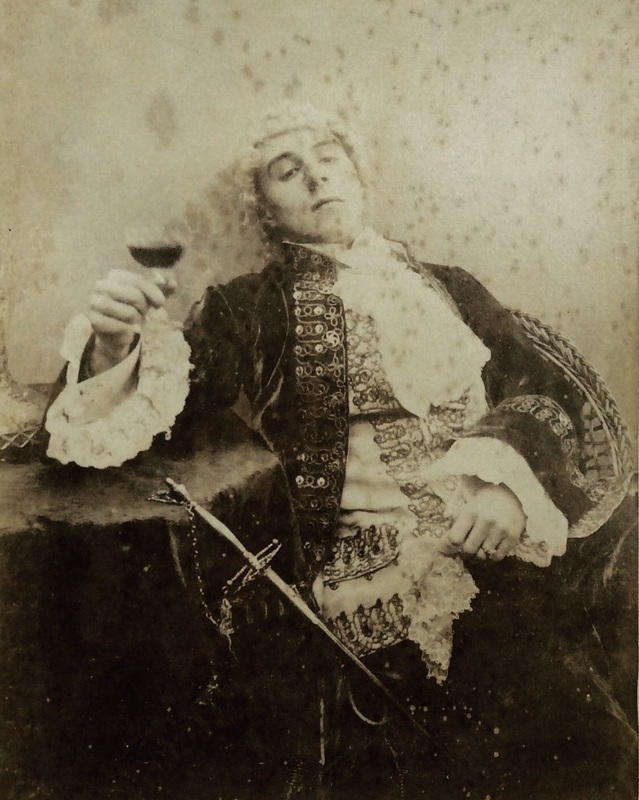 Her marriage to Mr Middleton is happy enough, but she is clearly not happy enough to be indifferent to the sympathy and care of a younger man, or to be quite indifferent to the prospect of a dear friend marrying another woman. It's a web of relationships that could feel messy and unnatural, but it doesn't. 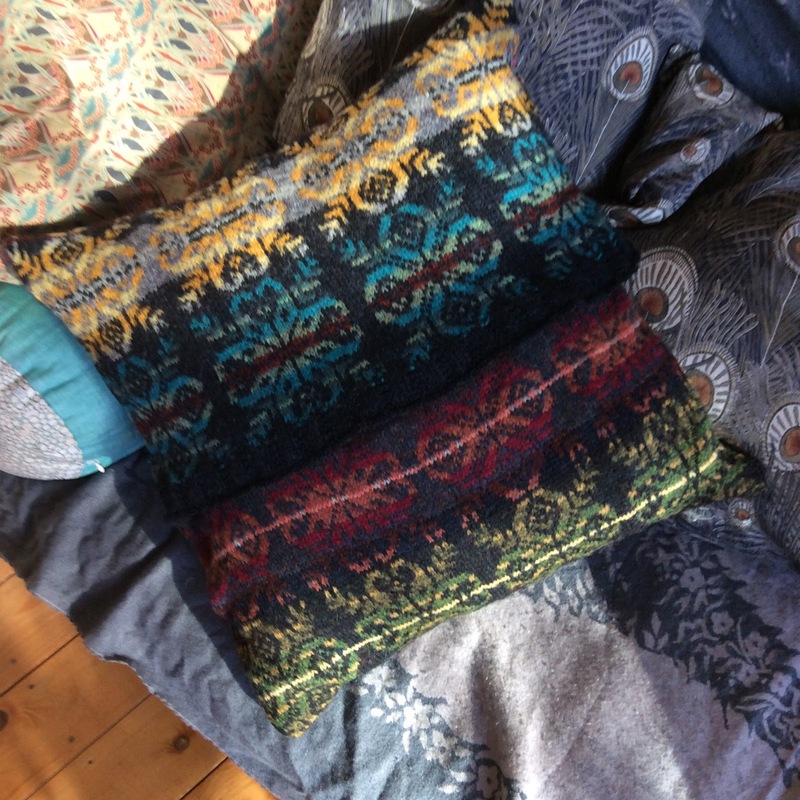 There's nothing melodramatic (at least I didn't think so) about the set up, though there easily could be, but rather a sense of affections becoming somewhat deeper than they should be for safety or comfort. Meanwhile, I'm sure Mr Middleton must have been based on someone real, and I'd love to know who. So far I haven't found any kind of definitive list of who Thirkell may have based some of characters on but he feels like a portrait, almost a chariciture but for a creeping compassion towards him, so my money would be on a family member. Beyond that it's the affectionate portrayal of county life that draws me back to Thirkell again and again. It may be idealised, she may be entrenched in her upper middle class prejudices and preferences, and quite so much solid comfort may be a fantasy, but she's spot on about agricultural shows. I've been happily immersing myself in Angela Thirkell's Barsetshire with the care of Virago's reissue of 'Northbridge Rectory' and 'Before Lunch'. There is also a kindle edition of 'Cheerfulness Breaks In' which I'm wondering what to do about. The nearest I've got to an ereader is a kindle app on my phone, but it's a far from satisfactory way of reading a book and if I'm going to spend almost the same as a paperback would cost - well I'd rather have a paperback. Especially for Thirkell, who I can't imagine approving of ebooks. On the other hand I do want to read it - it's all very annoying! My first brush with Thirkell was almost a decade ago and courtesy of an old penguin edition of 'The Brandon's' picked up in a second hand bookshop because she sounded vaguely familiar. I liked it enough to buy (and read) more of her books as I found them, and if they were cheap enough, but it's only really been since Virago started reprinting her that I've come to appreciate Thirkell properly. That's partly because they've increased the number of titles to be easily found at reasonable prices, partly because more people I'm aware of are discussing them as they come out revealing all sorts of details in the process, but mostly because I've re read quite a few of them along the way. Thirkell is definitely an author who rewards re reading. This is the first time I'd managed to get my hands on 'Northbridge Rectory' and I raced through it. Not very much happens, but it doesn't happen in a very enjoyable way. It's 1941 (or at least that's when the book was published) war is becoming familiar, but for the residents of Northbridge life is continuing much as normal albeit with some ominous clouds on the horizon. The book centres around 'Mrs Villars' the rectors wife. Her ten bedroom rectory (this seems like an enormous number of bedrooms, more so as I'm not sure it includes servants quarters) has had 8 officers billeted in it, who are probably much less trouble than evacuees. There's no problem with servants, rationing isn't posing any particular problems, the Villars have plenty of money, and their sons though both in the forces are neither of them doing anything especially dangerous. Mrs Villars is, all things considered, a lucky woman, but does she know it? And will her luck continue? For anyone reading these books with hindsight (I wonder how far away the world described here felt in 1951, I think almost as far away as it seems to me now) we know this comfortable upper middle class world is under all sorts of threats. Mrs Villars is a capable women, she would need to be to run her large household successfully, but she's a manager dependent on her staff and a private income and she's unsettled by signs of social change. The evacuees that have invaded Northbridge with a city bred indifference to the niceties of the county social order make her see that her world is being eroded away, but she, I suspect like Thirkell herself, can see no way to bridge the gap. I can only guess that Thirkell dealt with the world that disturbed her by writing the world that she wanted. Meanwhile there's the usual cast of people falling in, or almost in, love and just generally getting by. The most interesting of these (to me at least) is Miss Pemberton. Unattractive to look at, relatively poor, fearsomely educated, and something of a bully, it looked for a while as if she were destined to be the ugly sister, or the dragon from which her lodger, Mr Downing, will need rescuing and then there's a change of heart. Miss Pemberton is revealed as someone who wants someone to care for, and so she cares for Mr Downing with some inconvenience to herself. It's a very human desire to love and seems if anything to be maternal in nature. When she guards him from the possible advances of the towns ladies it's not so much because she wants him for herself as that she knows he can't afford to support another person. In the end she becomes an (almost) noble character, and one to sympathise with, which is new to me in Thirkell, normally she mocks. It's quite possibly the most beautiful food book I've ever seen. It might also just start to help justify my passion for pudding bowls - well all sorts of bowls really (so useful). But for someone who has made a summer pudding once in the last decade, her first Christmas pudding only 2 years ago, and no other sort of puddings at all, it's well past time to don an apron and get down to business. What makes it such a beautiful book is the photography, the back blurb tells me that Ysewijn is a photographer and graphic designer from Belgium who's photography is inspired by Dutch and Flemish Renaissance paintings. They most certainly are, and it doesn't do any harm that she's used a lot of Burleigh pottery as well (another minor passion). Beautifully styled cookbooks full of desirable props are nothing new, but this is still something special, and it's certainly the first time I've wanted to own any of the illustrations - there are a few I'd love to buy and have on my wall in here. Bruno Vergauwen's illustrations are also a delight, full of detail and humour. 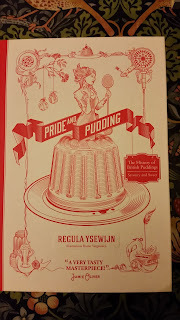 They're a perfect combination, as is the mix of history (for this book is just as much about the history of the pudding as it is cookbook) and recipes. I love the idea of food that has provenance and history, and with some exceptions (mostly tripe or offal based) love trying that food. What fascinates me most is the way in which herbs and spices were used and trying to trace the likely influence on different flavour combinations. It's something to stop and think about the journey those spices were making in the 17th and 18th centuries as well, and then there are discoveries like long pepper to be made (bless you Waitrose, and I hope you're still selling it when I want some more) and the realisation that pepper didn't always mean the same thing. Of course once discovered it's good to have some recipies to cook with these exotic old ingredients (I was interested to see how many call for barberries which I've also just noticed in Waitrose for the first time - serendipity!). The contents cover sweet and savoury puddings be they boiled, steamed, baked, batter, or bread. There is also a chapter on jellies, milk puddings, and ices. The original recipes are included along with Regula's updated versions. So far I haven't tried to make anything, partly because I've been to busy reading the book, but mostly because I need to organise people to eat the results, as well as find the time to potter in the kitchen for long enough to really enjoy myself (I don't think a pudding should be rushed, even if it can be). First up will be one called General Satisfaction though, because how could I resist such a name? (I can't, and can't imagine who would). And the best thing about this book? Once I'd got over the initial thrill of just how nice to look at it is, it's the realisation that it's as much a book for reading as for cooking from. The research is meticulous, the history lively and engaging, being able to taste it too is an absolute bonus. 'A story of love and loathing in modern Britain'. Reading this is as close as I'm going o get to any sort of tribute to Leicester City's (also known as the Foxes) premiership win, it probably won't surprise anyone that the link is tenuous. Foxes (the 4 legged kind) interest me far more than football or footballers do. 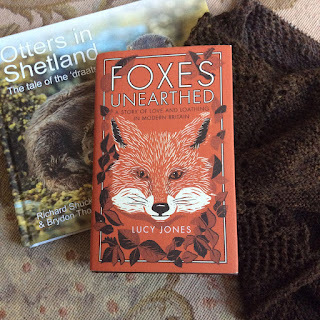 'Foxes Unearthed' also made a really good companion read to 'Otters in Shetland'. Otter hunting in Shetland was all about the income from the fur, but on mainland Britain it was a level sport right up until the 70's by which time the population had collapsed with otters totally driven out of many counties. It's inly in the last couple of years that they've recolonised every county in the country (I think I have that right). Urban otters are also apparently on the rise - I know they're in Leicester and I'm hopeful that one day I might see evidence of them. Currently the river Soar that runs through the city is both reasonably clean (I have seen kingfishers which is good sign, it also has plenty of fish in it) and the riverside itself not over developed - they could be just round the corner. Foxes colonised the city a long time ago, and are a not unusual sight. When I first moved into my flat it was waste ground and a semi derelict factory outside my window. There were foxes every night, and at this time of year I could watch cubs playing just below. It's now offices and a car park so they only pass through - I miss them. Where I live (no garden, bins inside, nobody feeding them) foxes are a delight to see, they seem fairly indifferent to human observers but there's still an undercurrent of wariness. They're part of a parallel cityscape that mostly exists just out of view. Lucy Jones covers all of this, examining the fox in folklore and through literature, looking at the facts behind its reputation as an indiscriminate killer, and our contradictory relationship with it - it seems we love to see them rather more than we love having them crap in our gardens, and that when the latter happens the first call is often to the exterminator. There is also a balanced look at hunting and the culture around it, although there's no doubt that Lucy is pro fox and non to keen on hunting. The only weak part of the book for me is her examination of hunt saboteurs. It's an extremely sympathetic portrayal, which is fair enough when that's where your sympathies are. But whilst she, probably correctly, is prepared to believe that hunts are sometimes breaking the law and deliberately chasing foxes, there is relatively little examination of the harder to justify aspects of sabbing. In the end that's a small quibble though. Hunting is a contentious issue that to often brings out the worst in those on both sides of the argument, and if my impression is that both sides are as bad (or as good) as each other in the field, I'm not the one who's done the research. The final chapter is the one to really consider. It's the urban fox again, and how their reputation is once more under threat. The idea of the fox as dangerous predator, a beast that will steal into your home and attack your child, is on the rise. We feed them, or dispose of food in such a careless way that it amounts to the same thing, have made the countryside increasingly inhospitable to wildlife, and then object to it becoming to comfortable in our own backyards. Why do we behave like this? 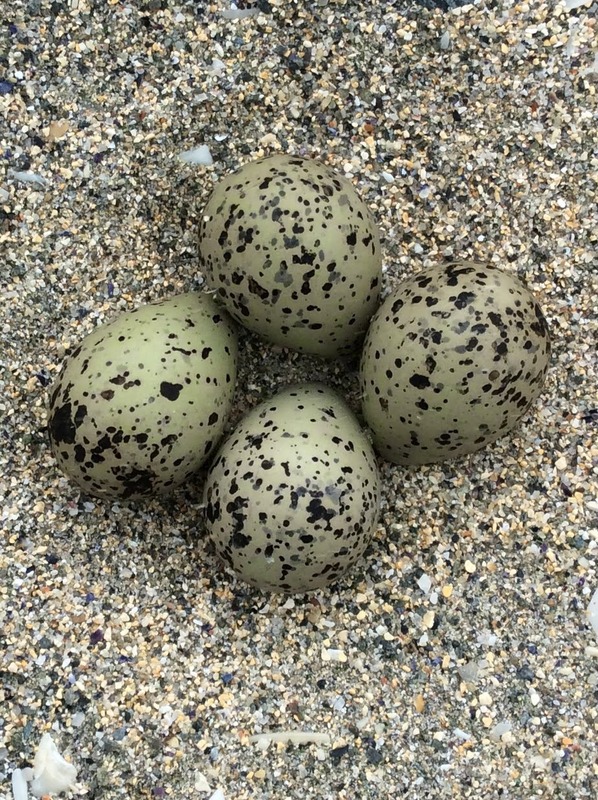 When I was growing up in Shetland in the '80's I was the sort of child who was fascinated by nature, keen on birdwatching, and a little bit obsessed by otters. Back then the otter population was still recovering from the depredations that generations of trappers had made on their numbers. Seeing them wasn't exactly unusual, but it was still something of an event. The more so because although it would have been illegal to hunt or kill them by then they weren't universally popular. We had a neighbour who would skin the occasional animal bought to him (roadkill) and he let us watch (which is the sort of revolting thing children enjoy) so I saw first hand the stray pellets of shot buried beneath the skin that showed there were still those prepared to take a pot shot at them. Those days are long past, Shetland has the highest density of otters in Europe, and I can pretty much guarantee that any visitor who keeps an eye out will see one. On a visit home a couple of years ago I was looking out the sitting room window at the pond in the garden when I realised there was one in there (playing with some plastic ducks) I would have had some photos if invading sheep hadn't caused a big enough disturbance to scare off a far less wary animal than an otter. 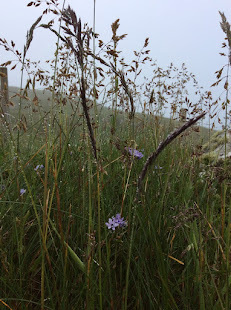 Apart from in my dad's garden they're also a reasonably common sight around some of the ferry terminals, and have been spotted wandering through Lerwick (the main town). It's not just the density of the otter population that makes Shetland such a great place to spot them, but also its geography. You're never very far from water, fresh or salt (otters need to wash in fresh water so ponds near the sea - like dads - are not a strange place to see them) so generally it's enough to just keep an eye out. 'Otters in Shetland' is a beautiful book - almost as good as having an actual otter in front of you, or if not quite that good, at least it's teaching me so much more than I knew before. It takes a comprehensive view of the habitat and diet of the Shetland otter before exploring all aspects of their life and habits. We get to see them at their cutest - snuggling up in family groups, but also as the efficient predators they are; a useful reminder not to anthropomorphise these creatures to much. They're charismatic animals with a definite presence when you see one close up, but they're also at the top of their food chain and not to be argued with. 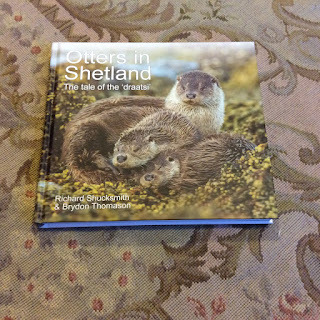 Bryson Thomason and Richard Shucksmith both lead photographic tours of Shetlands wildlife (if you're planning a visit and don't want to leave otter spotting to chance these would be the men to speak to). They clearly know the landscape and its inhabitants intimately and that really comes across. In truth this is a niche interest book, it's published by the Shetland Times, and whilst it's available via Amazon as well as through the Shetland Times Bookshop, Waterstones don't stock it in their warehouse (though they will order it). 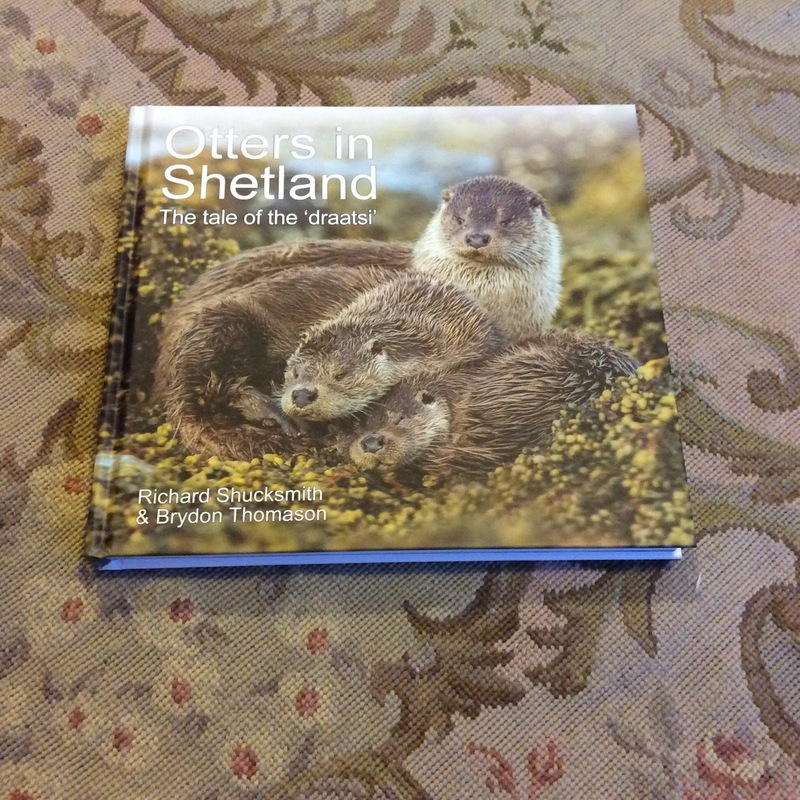 The chances are that it will be bought mainly by people in or visiting Shetland, but for anyone with an interest in otters it's worth a look. There are some remarkable images, good advice about otter spotting, and it's a timely updating of the ongoing story of the otter and our relationship with it in Shetland and beyond. There are a few books that I have stacked up to write about, really need to write about in fact as reviews are promised to other people, and today was going to be the day that I dealt with them. But then the weather was so nice, and it's not meant to last, and I went shooting instead. 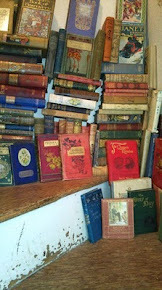 On Sunday I'll definitely deal with the book pile. 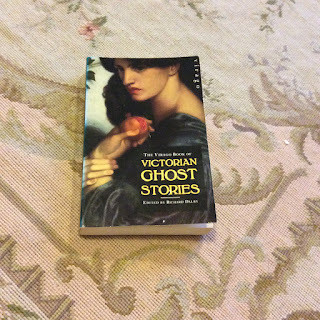 On my way to meet mum to go shooting I had time to nip into a couple of charity book shops - where I found 'The Virago Book of Victorian Ghost Stories' which I'm quite pleased with. I already have 'The Virago Book of Ghost Stories' which is a best of compilation of Victorian Ghost Stories and 2 further volumes of yet more ghost stories, so there's a bit of overlap, but also plenty of new to me things to look forward to. My love of a good short story collection has been mentioned before, and I'm fairly keen on victoriana too so I really am pleased with this find. As an added bonus the book doesn't look like it's ever been opened - I hope I do rather better with it. 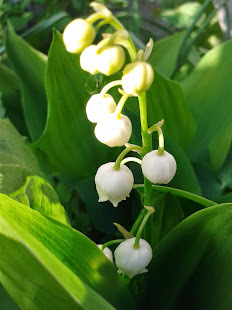 It's been an almost perfect weekend, after the bank holidays efforts with snow, rain, and biting cold the weather for the last couple of days has been glorious - finally seasonal, and very welcome for anyone not afflicted with hay fever. My weekend was only marred by a startling encounter with an enormous spider in my bed on Saturday night. Not only was it roughly the size of a mouse (okay, it was just a very big spider, not actually mouse sized) but it was just about to get tangled up in my hair which - yuck. After a bit if messing around I got it out of the bed but don't know where it went - so because big spiders freak me out I basically didn't sleep. Happily this was at my mother's house so It's no longer my problem. Meanwhile back in town, Leicester City did something impressive football wise. I live close enough to the stadium to decide that I'd rather be elsewhere for the night, as I write on Sunday evening the street cleaners haven't got this far yet, so I have ample evidence to suggest that I'd have got even less sleep at home than I did being menaced by a giant spider. Part of me thinks I should have witnessed some of this historic event, but mostly I'm extremely grateful to have spent the day with mum and her dog. It was also D's birthday so I baked a cake - it's been a while - which turned out well enough to deserve a share. 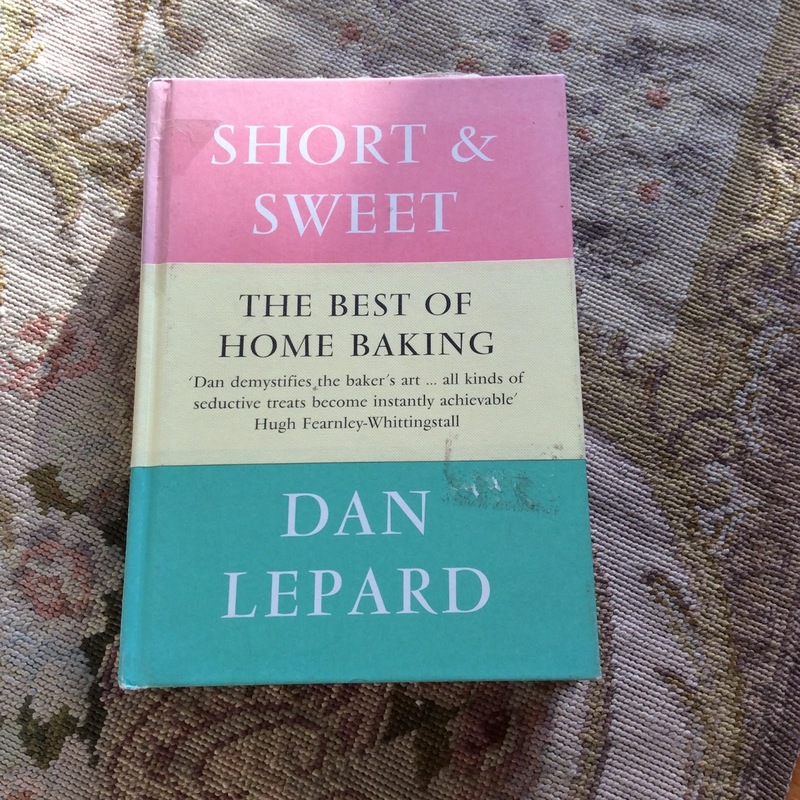 He wanted a fruit cake so I turned to my increasingly battered copy of Dan Lepard's 'Short & Sweet' and found a Cinnamon Honey Fruit Cake which sounded to be just what was required. The recipe can be found Here so I won't write it out again. I used quite a strong heather honey because it's what I had, and was surprised at how strongly the flavour came through. It's good to have a tried and tested fruit cake recipe which cooks in under 3 hours though, and which takes fruity substitutions well (though they all do that I suppose). Now I have the not so awful task of sorting out which books I've committed to read for other people and dealing with them, and the not so enjoyable job of preparing for work tomorrow. It looks like it's going to be hot again, and another 3 day weekend would have been most welcome. Surely there should be a rule about the first properly sunny Monday, the one when Summer actually seems really just round the corner, and especially on the heels of a cold, cold, spring, where everyone just gets the day off? A bank holiday weekend, some great new books, and my kitchen inspiration seems to be well and truly back. I loved Sabrina Ghayour's first book, Persiana, when it came out so I've been quietly excited about what her next one might contain. Well it's here now and the first nice surprise comes in the form of colourful shiny bits on the cover. It's a little thing (and obviously has nothing to do with the contents) but the effect is pleasingly colourful and uplifting. The sky outside is grey and cloudy, I'm ready for cheerful. The second thing I noticed before I even opened the book is that it has 2 place marking ribbons, again it's a small thing, but helpful and I like it. The reason I loved 'Persiana' was that it was full of simple things with great flavours, there are a handful of recipes from it that have become standard fall backs in my kitchen, and it's one of the first books I turn to if I want something that's going to be easy to cook and please everybody. 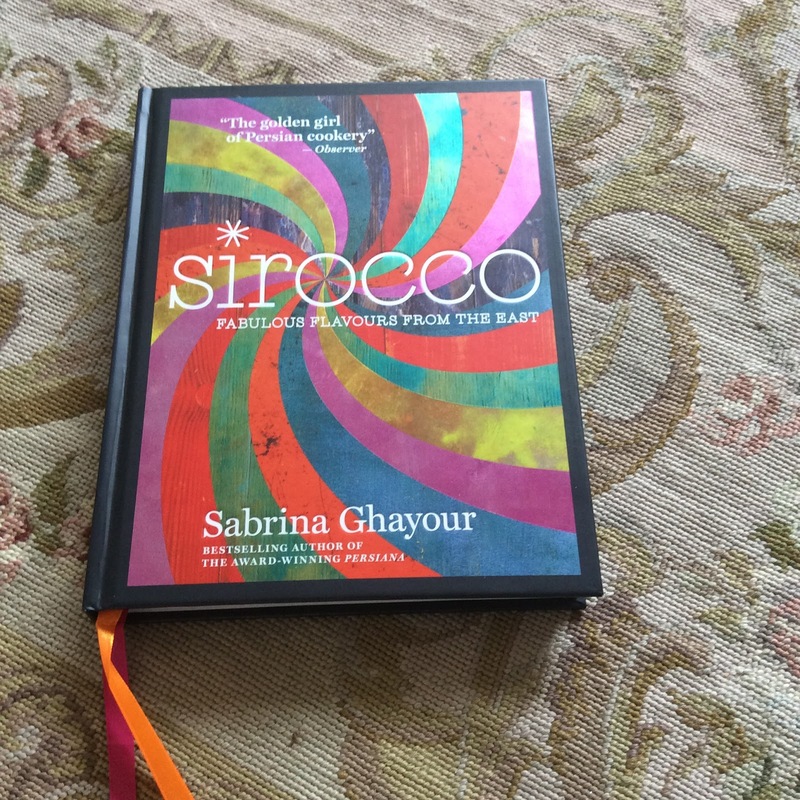 The third thing I like about 'Sirocco' is the continuation of that emphasis on flavour, along with the particular philosophy behind it. "Sirocco" to quote is "a hot dry wind blowing from east to west - sometimes described as warm, spicy and sultry". Ghayour's wider heritage may be eastern, but she was raised in the UK - different produce, techniques, and recipes. This book is to be a blending of both traditions, so whilst not authentically Middle eastern it has an authenticity of a different sort that appeals to me. I live a few hundred yards from the most multicultural street in the country (it was in the papers, so it must be true). In the time that I've known the city I've seen the Narborough road (before my time it would have been white working class) change from predominantly Indian in character (sari and gold shops made it look incredibly exotic to a girl from Shetland when I first saw it) to something much more mixed in character with Eastern European and Turkish shops taking their place now as well. The flavour of Leicester is whatever you want to make it these days (and maybe always has been, the Romans, the Saxons, the Vikings, the Normans, all left their mark on the city a thousand years and more before the waves of immigration the 20th and 21st century have seen). Personally I can't resist interesting new (to me) spices or other ingredients any more than I can resist a classic pork pie. 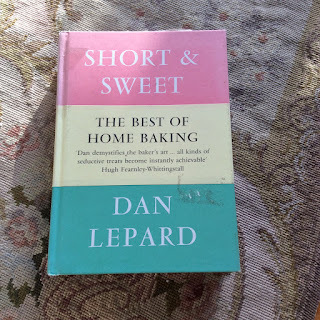 In short it all makes the flavours in this book an authentic reflection of what I see around me (which is another reason I love Ghayour's recipes). The recipe I had to try first was Quince glazed chicken fillets, it uses membrillo, easily available from any supermarket, I used quince jelly (because I had it) made with quinces scrumped from the museum garden last autumn (I'm anxiously waiting for the tree to flower again, the weather has not been kind). The quinces I can buy in Waitrose the autumn are Turkish, which makes me think someone in the UK ought to have a commercial orchard to cut down on food miles). They were delicious and as good an example as any of being able to use very local ingredients with a slight twist. The next chicken dish to get an outing will be orange thyme and spice chicken wings, it uses. marmalade and as I always have more of that than I need this sounds like a winner. But then the whole book is full of things I want to try - the salads especially look fantastic. It's the time of year for publishers catalogues to start making an appearance for the second half of 2016, something I generally look forward too (it reminds me a little of the Puffin book club from school days). As a modest sort of blogger I don't get inundated with these (it's always possible the shine might wear off if there were to many) and there are two in particular I look forward to. They're the Oxford University Press, and the British Library ones, and after a very enjoyable half hour with coffee, donuts, and catalogues I thought I'd share the books which have caught my eye. With the British Library catalogue the appeal is obvious - a bonus feature is that it tends to have lovely illustrations, but essentially it's the list of upcoming crime classics that I get particularly excited by. I won't list all of these (though 'Crimson Snow' is such a splendid title for this years winter/Christmas themed short stories it has to get a mention) because inevitably I want them all. Horror A Literary History by Dr Xaviet Aldana Reyes sounds fascinating though and I'm really excited (possibly over excited) by the prospect of Lost In A Pyramid and other classic Mummy stories - that's surely going to be spectacular. The Haunted Library also sounds guaranteed to keep me happy. The joy of the OUP catalogue is its variety, the first things I catch my attention/go on my wish list is Gothic Tales from Arthur Conan Doyle. Helen Constantine's anthology Paris Street Tales has been earmarked for a friends birthday. Due out in August it sounds like perfect high summer reading. For myself The Mind of the Book by Alastair Fowler sounds fascinating. It explores the fine art of the title page and their place in the history of the book. Simon Yarrow's The Saints: A Short History covers a subject I really enjoy (5th century vampire slaying bishops - how could I resist?). Eleanor Barraclough's Beyond The Northlands which looks at Viking voyages and the old Norse sagas is the sort of book I want to read but take forever to get round too, so it's lucky it will appeal to D as well, another one to be filed as 'great gift'. He would probably love Caroline Shenton's Mr Barry's War about the rebuilding of the Houses of Parliment as well. We both love gothic revival architecture (we're a lot of fun to be around). I'm also intrigued by Peter Leary's Unapproved Routes, histories of the Irish border 1922-1972. It's something that interests me both in terms of Irish history, but also because we could still end up with a similar situation on the British mainland. Meanwhile new editions of Trollope's The Way We Live Now and George Gissing's New Grub Street are a reminder to read both, especially the Gissing who I'm definatley not well acquainted enough with. So there you go - some of the books I'll be particularly looking forward to over the next 6 months. I'm very glad to be done with this project. Initially I thought it would make a nice birthday present for D, a year ago. 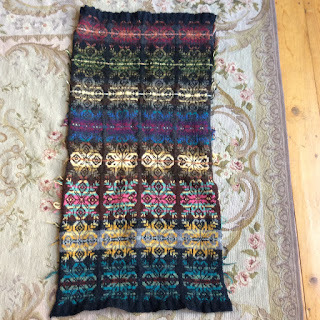 I finished knitting it this Febuary so hopefully it will still make a nice present, at least it's done in time for his birthday this year (next week, I'm so on top of this, his cake is just out of the oven as well). Finishing it was a definite achievement, it's the biggest thing I'd attempted, and confirmed everything I suspected about myself and the danger of losing steam half way through a thing and abandoning it for months on end. It also taught me a lot about combining colours, which I do not find as easy as I assumed it would be. 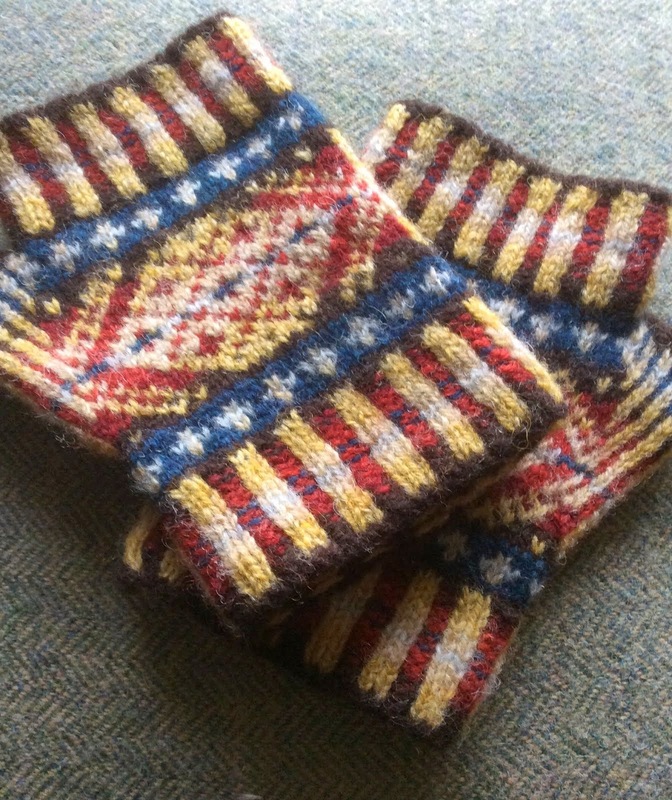 So far I've come to the conclusion that you can either start with the limited palate that traditional fair isle patterns use (dictated by the colour of the sheep and I guess the dyes that could be made locally) and which I didn't have because they hadn't especially caught my eye. Or you should probably start with a particular point of reference for inspiration. I didn't do that either. 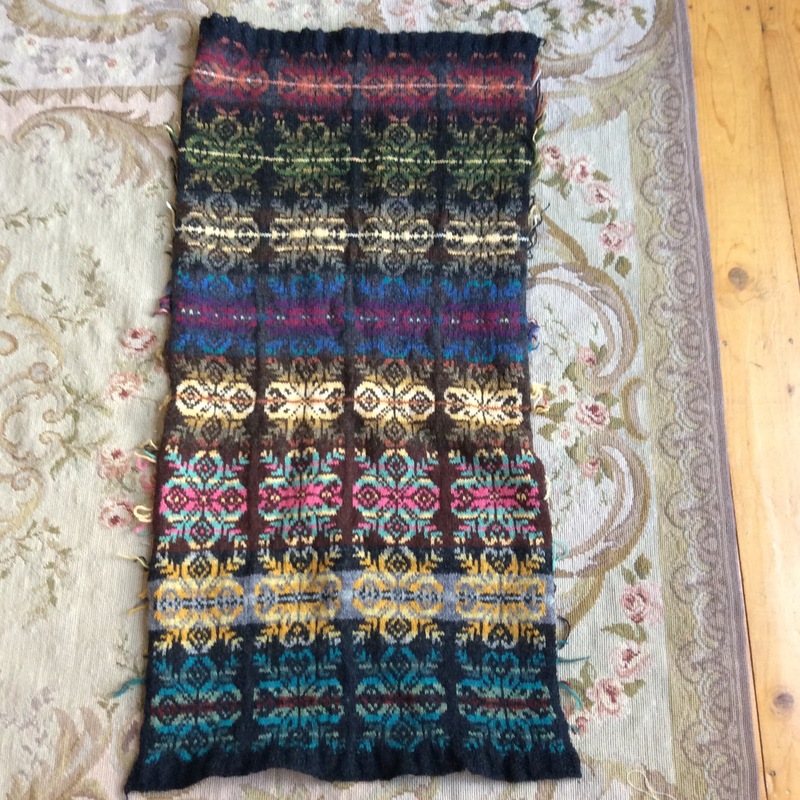 What I did have was a bag of yarn that I'd bought in the same way I might have chosen pick and mix sweets - a ball of everything that appealed to me, with no thought at all about how they might work together. 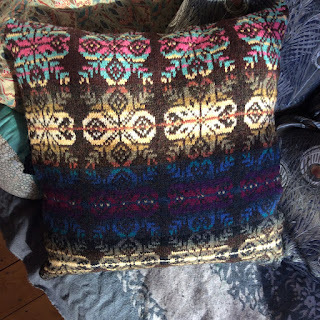 The idea behind the cushion cover was that it would let me knit something sizeable with all those balls of wool and the variety of colours wouldn't be such a problem. Mostly that's worked, and at least I now know how to make a better job of it next time - which can be summed up as plan everything properly. Meanwhile it'll be comfortable to sit on and I've become quite fond of it, faults and all. 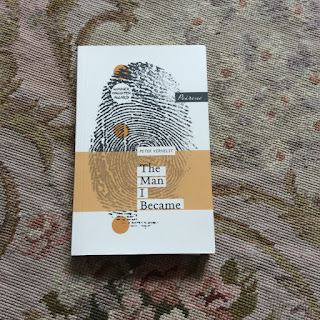 With time off and a train journey just the right length to be filled by a novella though it would have been positively wrong not to read at least one of them so I chose 'The Man I Became' by Peter Verhelst. It's from the fairy tale series and is narrated by a gorilla (or is it?) plucked from the jungle and trained to become human. The introductory paragraph describes it as a mixing of Huxley's 'Brave New World' which I haven't read (and probably should) with Orwell's 'Animal Farm' which I have read and found every bit as depressing as Orwell could have intended. 'The Man I Became' on the other hand I found uplifting more than anything else, or at least hopeful (does that bode well for 'Brave New World'?). The story starts with the gorilla's at home in the jungle (if the back blurb didn't specifically say gorilla I would have been wary of making the assumption, I don't think it's ever explicitly stated so much as implied, and that ambiguity is useful) but members of the group keep disappearing, until eventually someone comes for our narrator. After that the group is marched across a desert, caged in a ship, and then trained in boot camp conditions to pass as human, eventually some of them may even become human, but can training truly overcome instinct, and what are principles when it comes to self preservation? On the most basic level the story races along because it's clear from the start that this is a set up that can only end up in some kind of disaster, and I wanted to know how it would play out - the answer to that question was unexpectedly satisfying, and in the end hopeful. Just under the surface the allusions to the historical slave trade, modern people trafficking - both refugees, and for those still essentially slaves - capitalism, the short comings of western culture, how we measure success, mould history, generally treat each other, and identify ourselves and others provide plenty to think about. one interpretation or moral. There's also a lot to consider regarding how we treat those we see as better than ourselves, and those we see as somehow less - socially, racially, educationally - pick your prejudice. But in the end all I can say is read it and see!